Isidre Esteve just keeps upping his game in the 2018 Dakar Rally. The Repsol Rally Team driver is adapting very well to the demands of the route and on SS05 he once again worked his way up the provisional classification. With only one day left before the rest, the Lérida-born driver is already in 26th place overall and 3rd in the T1.2 category, thanks to his Sodicars BMW BV6 prototype with adapted controls on the steering wheel. 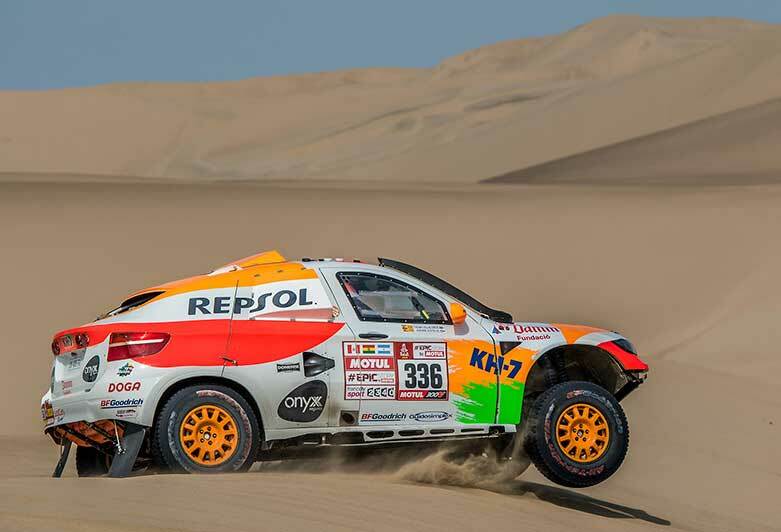 Isidre and his co-driver Txema VIllalobos ended in 38th place, having lost time because of the confusion caused by the directions they received from a helicopter. "They signalled from the air for us to steer clear of the dunes. We thought there was some danger ahead and we followed their instructions, as did a Russian driver," the former biker said. "When we realized we had gone off course without good reason, we decided to go back to the designated route, without skipping any waypoints", a disconcerted Isidre Esteve explained. The Repsol Rally Team has reported these strange circumstances to the organizers and hopes to be able to get back part of the half hour they estimate they lost. Due to these unusual circumstances, they started the second part of the special behind and had to overtake several trucks along the way, facing the difficulties and dangers this entails. In addition, with a hundred kilometers already behind them, they were caught in a jam that had formed on a very narrow crossing. "The Coronel brothers buggy had flipped over in a canyon and caused a jam of some twenty vehicles. We must have been stalled for nearly 20 minutes, until they finally managed to remove the buggy". Beyond these two situations (which were not related to his driving), Isidre Esteve did not face any additional setbacks and completed the special, in good measure thanks to the excellent work of his co-driver Txema Villalobos. Their joint effort took the Sodicars Racing BV6 prototype to the finish line, ending in 32nd place after five hours on the road. They have climbed to 26th place overall in the provisional classification, and to 3rd in the T1.2 category (4x4 off-road modified diesel cars), with a total accumulated time of 23 hours, 23 minutes, and 7 seconds. At the end of the day, Isidre Esteve revealed one of the keys to his remarkable performance during these complicated stages in Peru: "The key to these good results was finding the ideal pressure for the tires, which allowed us to drive over both the soft dunes and rock tracks: Less than one bar. This means we don't have to to stop to inflate or deflate the tires and, this way, we save a lot of time."